Leadership at all levels in the College is based on service and strives to empower others to take control of their lives. We aim to create an atmosphere that is supportive of parents in their role as educators of their children, and an environment that assists students to take their place in a democratic, multicultural nation. Students are given the opportunity to develop leadership skills through participation in a large number of committees including the student council, the student advisory committee (SAC), and the curriculum, liturgy, cultural, academic, outreach, spirit and sport committees. Each committee is led by a Year 12 captain and supported by a captain from each of the college house groups. The Year 12 captains are chosen by peers after a nomination and interview process to determine their suitability to the roles and the commitments associated with them. Students who nominate for captaincy must have shown ongoing dedication to community involvement across their time at the college. There are fourteen captains in total. Year Level House Captains and SAC representatives are also chosen to encourage participation and commitment to all things Mount Alvernian. Students can also be nominated to be part of the College’s peer support team. 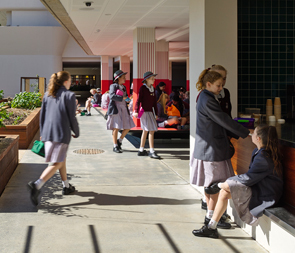 These students, normally from Years 11 and 12, make connections with students who may be experiencing challenges in their lives or in their relationships with others. Members of the peer support team are trained for this position by the College Guidance Counsellor. Students in all year levels are encouraged by their relevant Year Level Pastoral Guardian to see leadership as a responsibility not a title.